Virginia State Police arrested a soldier from the National Guard base at Fort Pickett in Blackstone on Tuesday after they fled in a stolen armored vehicle, WTVR reports, leading cops on what appears to have been about as close to a high-speed chase the trooper could achieve at the vehicle’s maximum speed of 40 miles per hour. State Police says at 7:55 p.m., they were notified that the vehicle, which is not equipped with a weapon, was taken from Fort Pickett, a National Guard base in Blackstone. They pursued the vehicle after receiving the initial report and traveled along with it from Nottoway County to downtown Richmond. 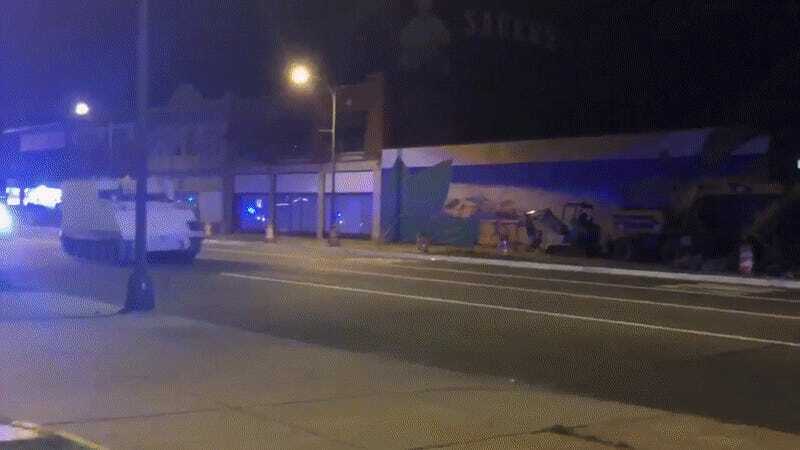 A witness, who saw part of the pursuit play out on West Broad Street near VCU, says he knew something was wrong when he heard the thunderous sound of the military vehicle. Crime insider sources says the suspect, whose name has not been released, is a Virginia Army National Guard Lieutenant and lives in the fan area. Sources say the Lieutenant is a commander with an engineering battalion at Fort Pickett. According to WKTR, no crashes or injuries were reported. Videos posted to social media appeared to show police cruisers involved in the pursuit giving the driver a wide berth, which was probably a good idea. Numerous sources made it clear that even if it resembles a “tank,” the vehicle in question is not. Instead, it appears to be an M577, a vehicle designed for use as a mobile command post by military officers or other support roles. According to Military Today, the M577 is a variant of the M113 troop transport that weighs approximately 11.6 tons and is lightly armored to protect against small arms fire and artillery shrapnel. The M113 family is a dated design that saw heavy use in the Vietnam War and is (slowly) being phased out in the US military, which just about squares with the kind of equipment National Guard units tend to get. According to WTVR, charges are pending against the suspect who led officers on the chase.